So, unbelievably, the first two weeks of Masters classes are over, and it feels like I’ve been here two months. People tell you Masters are hard, but I don’t feel like anybody really prepared me for how quickly you really have to get down to work. After OWL, the orientation week for international students, I don’t think anyone was prepared to actually begin their Masters. OWL felt like a very long drinking holiday, a blur of seeing new things and meeting new people. I’m not saying this wasn’t fun; I met some great people during OWL week, and had a lot of fun exploring Leiden with them. At the same time, though, I was not prepared for classes to start. It didn’t help that I hadn’t yet found anyone doing my Masters course. I found out later that this was because I was the only international student studying my Masters. This was daunting, to say the least. (Especially when your professor introduces you in front of the entire class as the sole international student.) It should have been obvious to me that here, at a Dutch university, there was bound to be a large amount of Dutch students. But once again, OWL week doesn’t prepare you to be surrounded by Dutch speakers, who, to my anxious eyes, seemed to have already divided off into neat friendship circles. Thinking retrospectively, this was silly of me. Indeed, I find out towards the end of the first week – when everyone is simultaneously stressing about having to finish a shockingly long and complex work for one of our classes – that they are finding this just as difficult as me. They’re also doing this in their second language, when my Dutch knowledge basically hasn’t got past responding with “Ja, lekker!” to anything said to me. #3 Join the study association of your Masters, if you have one. It may just be a glorified drinking club, but you’ll have fun either way. 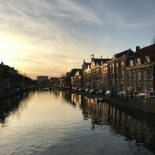 This entry was posted on September 24, 2017 by Abigail@TheLeidener in Student Life, Study.